As the faithful gather around their capering shamans in Paris for the New Superstition’s annual festival of worship, the Pause lengthens yet again. 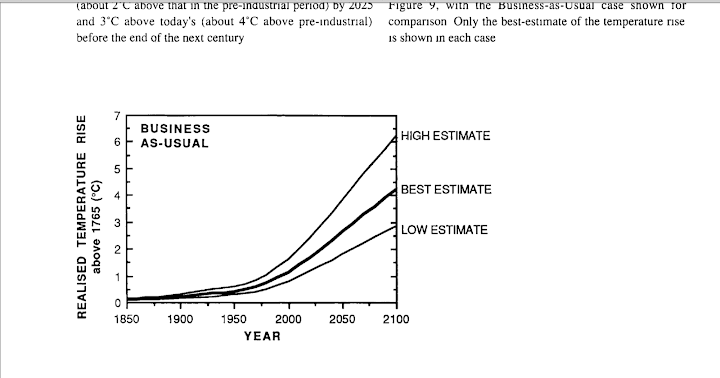 One-third of Man’s entire influence on climate since the Industrial Revolution has occurred since February 1997. 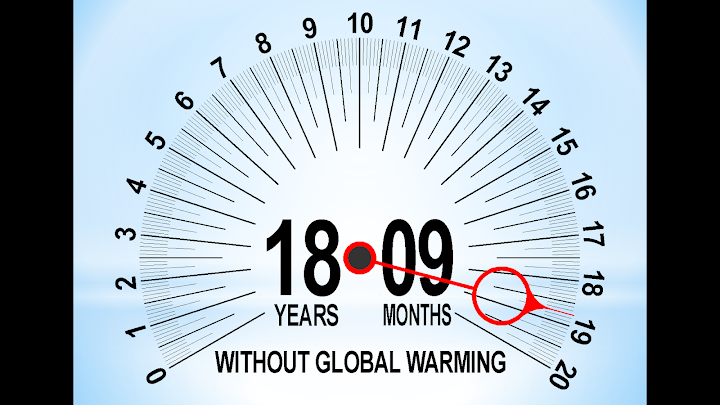 Yet the 225 months since then show no global warming at all (Fig. 1). With this month’s RSS temperature record, the Pause beats last month’s record and now stands at 18 years 9 months. Figure 1. 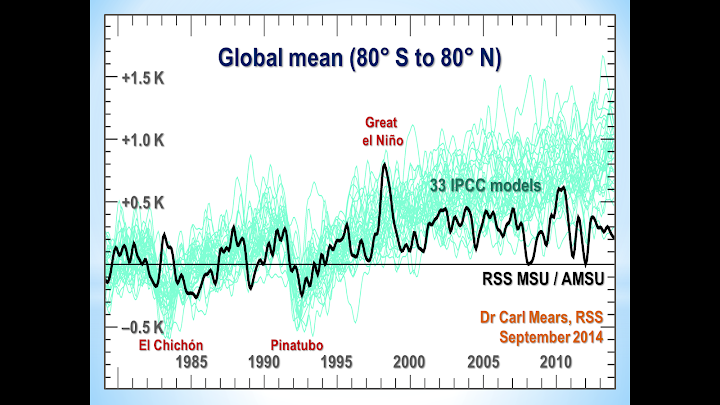 The least-squares linear-regression trend on the RSS satellite monthly global mean surface temperature anomaly dataset shows no global warming for 18 years 9 months since February 1997, though one-third of all anthropogenic forcings have occurred during the period of the Pause. The accidental delegate from Burma provoked shrieks of fury from the congregation during the final benediction in Doha three years ago, when he said the Pause had endured for 16 years. Now, almost three years later, the Pause is almost three years longer. It is worth understanding just how surprised the modelers ought to be by the persistence of the Pause. NOAA, in a very rare fit of honesty, admitted in its 2008 State of the Climate report that 15 years or more without global warming would demonstrate a discrepancy between prediction and observation. 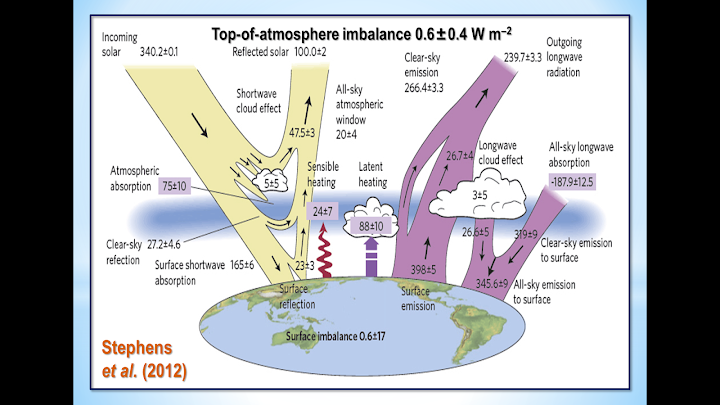 The reason for NOAA’s statement is that there is supposed to be a sharp and significant instantaneous response to a radiative forcing such as adding CO2 to the air. 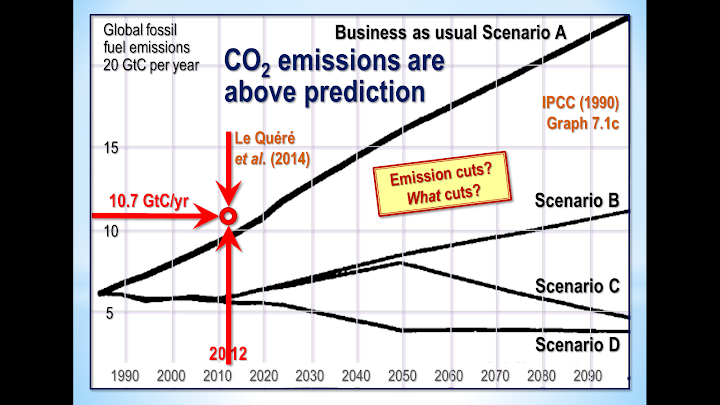 The steepness of this predicted response can be seen in Fig. 1a, which is based on a paper on temperature feedbacks by Professor Richard Lindzen’s former student Professor Gerard Roe in 2009. 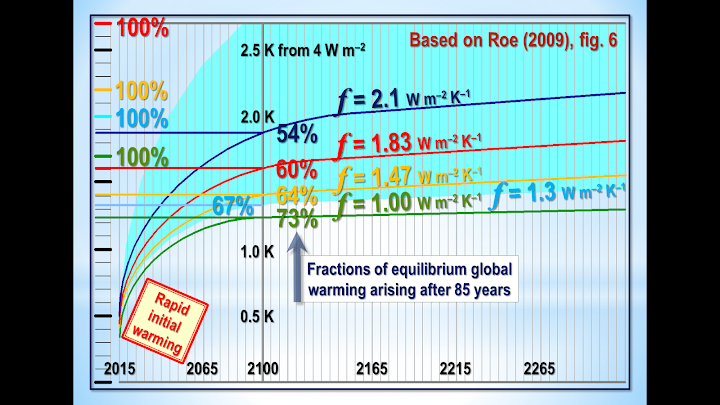 The graph of Roe’s model output shows that the initial expected response to a forcing is supposed to be an immediate and rapid warming. But, despite the very substantial forcings in the 18 years 9 months since February 1997, not a flicker of warming has resulted. 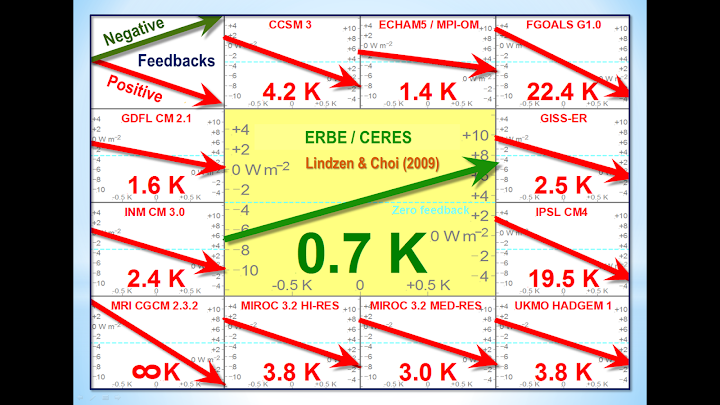 At the Heartland and Philip Foster events in Paris, I shall reveal in detail the three serious errors that have led the models to over-predict warming so grossly. The current el Niño, as Bob Tisdale’s distinguished series of reports here demonstrates, is at least as big as the Great el Niño of 1998. 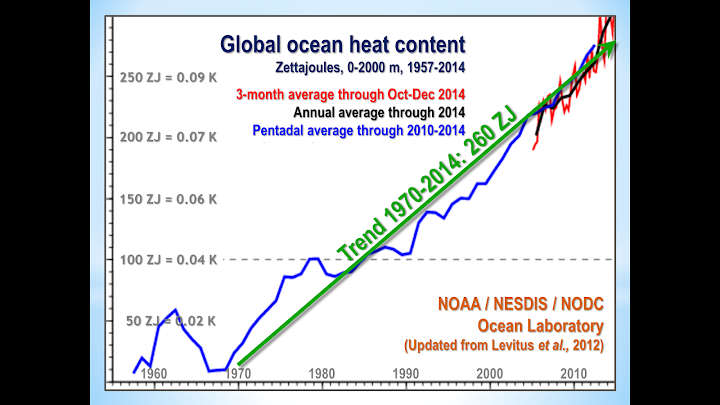 The RSS temperature record is beginning to reflect its magnitude. From next month on, the Pause will probably shorten dramatically and may disappear altogether for a time. However, if there is a following la Niña, as there often is, the Pause may return at some time from the end of next year onward. The hiatus period of 18 years 9 months is the farthest back one can go in the RSS satellite temperature record and still show a sub-zero trend. The start date is not cherry-picked: it is calculated. 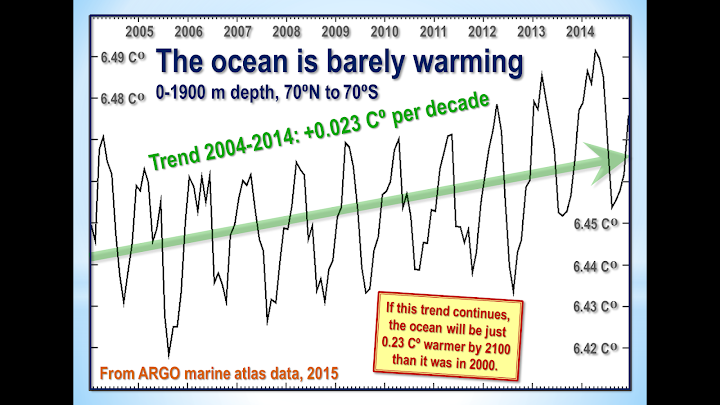 And the graph does not mean there is no such thing as global warming. Going back further shows a small warming rate. So long a stasis in global temperature is simply inconsistent not only with the extremist predictions of the computer models but also with the panic whipped up by the rent-seeking profiteers of doom rubbing their hands with glee in Paris. Figure 1b. The least-squares linear-regression trend on the mean of the GISS, HadCRUT4 and NCDC terrestrial monthly global mean surface temperature anomaly datasets shows global warming at a rate equivalent to 1.1 C° per century during the period of the Pause from January 1997 to September 2015. 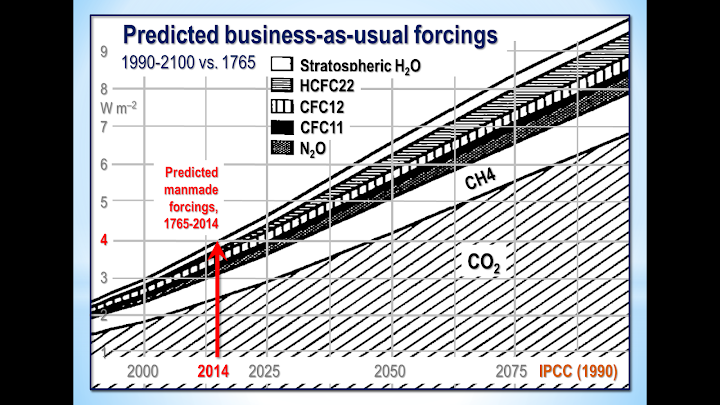 Bearing in mind that one-third of the 2.4 W m–2 radiative forcing from all manmade sources since 1750 has occurred during the period of the Pause, a warming rate equivalent to little more than 1 C°/century is not exactly alarming. Figure 2. 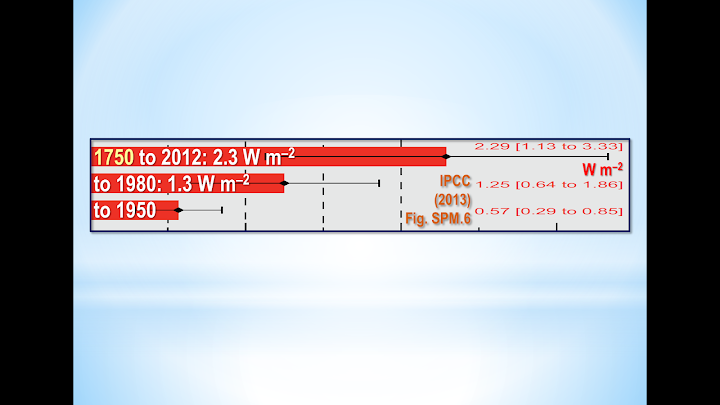 Near-term projections of warming at a rate equivalent to 2.8 [1.9, 4.2] K/century, made with “substantial confidence” in IPCC (1990), for the 309 months January 1990 to September 2015 (orange region and red trend line), vs. observed anomalies (dark blue) and trend (bright blue) at just 1.02 K/century equivalent, taken as the mean of the RSS and UAH v.6 satellite monthly mean lower-troposphere temperature anomalies. 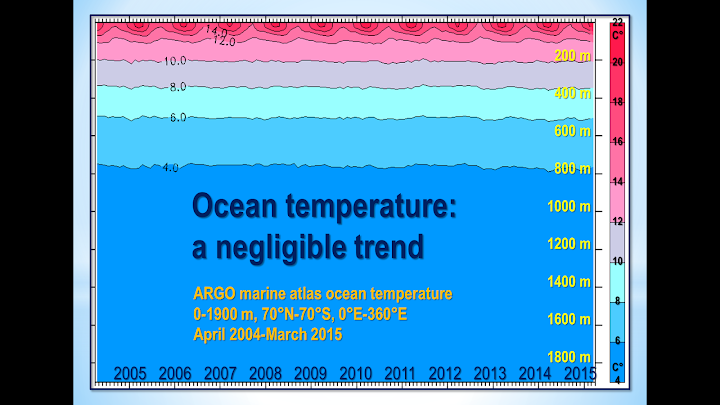 As ever, the Technical Note explains the sources of the IPCC’s predictions in 1990 and in 2005, and also demonstrates that that according to the ARGO bathythermograph data the oceans are warming at a rate equivalent to less than a quarter of a Celsius degree per century. In a rational scientific discourse, those who had advocated extreme measures to prevent global warming would now be withdrawing and calmly rethinking their hypotheses. However, this is not a rational scientific discourse. On the questioners’ side it is rational: on the believers’ side it is a matter of increasingly blind faith. The New Superstition is no fides quaerens intellectum. 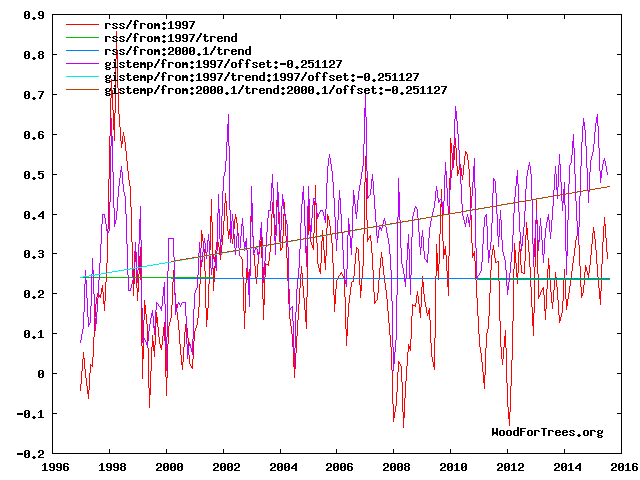 The RSS satellite dataset shows no global warming at all for 225 months from February 1997 to Octber 2015 – more than half the 442-month satellite record. 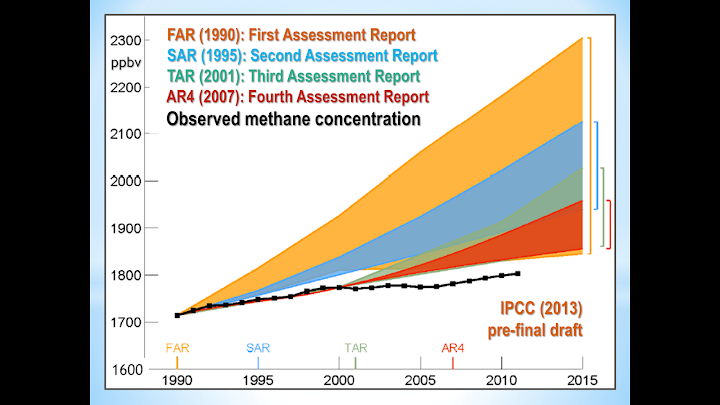 There has been no warming even though one-third of all anthropogenic forcings since 1750 have occurred since the Pause began in February 1997. The entire RSS dataset for the 442 months December 1978 to September 2015 shows global warming at an unalarming rate equivalent to just 1.13 Cº per century.